Bhandardara is a place whose beauty emerges only after the rains. Located around 70 Kms from Nashik, the best part of going to Bhandardara by road with your own transport is the serenity it offers all along the way. The Nashik highway iscomparatively clear of heavy traffic. The expensive reaches of the road & the hills in the distance fill you with a sense of liberation as you leave behind the clogged air of the city. Bhandardara without the rains is an ordinary, dull & forming into the rising wind. Built in 1926, the Bhandardara dam is one of the oldest dams in Asia & is known for its Umbrella Falls which provides a most picturesque sight for trigger – happy photographs. 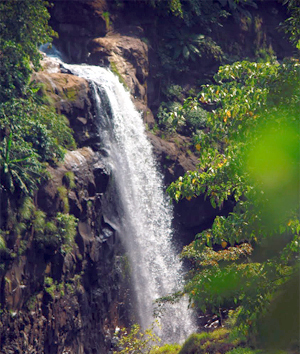 There is another waterfall known as the Randha fall which is about 11 Kilometers from the dam. Here, the water gushes down the rock face to all 45 meters into the rocky ravine, forming a bubbling stream which, apart from offeringa glimpse of natural design, looks extremely dangerous. Those with a touch of vertigo may do well a stand back from the edge. While there is an excellent point just opposite the waterfall for a perfect view of its casecading effect, the place has not been provided with any railings or other security measures so that a bit of daring could go a long way right into the gorge. For those with a yen for trekking, there is the well known Kalsubai peak, the highest peak of Maharashtra state on the Sahyadri range, standing 1,646 meters above sea level. Dense foliage & uncharted territories lead the way up to temple & although the tourist books would have you believe that there is flourishing wild life sanctuary on its premises, we couldn’t lay our sights on any four-legged creatures. Not even a mongrel. For the religious-minded, there is the Amruteshwar temple, reachable by boat which houses the idol Shiva. A further excursion leads you to the Ratangad bhandardaraFort, which, however, is not as impressive as the other forts of the state. If it’s the sheer thrill of a drive that you seek & are ready to grapple with some absolutely kutcha stretches of road, Ghatghar is the spot you should head for. The dense fog envelopes you in its ghostly form & as you stop with the strong feeling of having lost your way, there emerges from the fog a figure covered in a blanket. Baring his tobacco-stained teeth, he greets you with a Ram, Ram & is kind enough to inform you that yes, you have indeed lost your way. Ghatghar, located 22 Km. from Bhandardara, has on offer a point from where the view would no doubt be terrific except that in the monsoons the chances of the entire view being blocked out are more likely than not. Thanks to the recently built private hotel at Bhandardara, one is no longer at the mercy of the MTDC which offers cottages & dormitory bunk beds. The charges for lodging at Bhandardara vary from Rs. 300 to Rs. 700 per room & meal facilities are available with the private hotel as well as the MTDC restaurant. For non-vegetarians, the gavthi chicken & the dam fish should provide for a real change of taste from the Moghlias & the Manchurians of the city. MTDC bookings ( Tel Nos. : 628169, 626867 ) are best done in advance to avoid the surliness of its employees. The only plus point of the MTDC resort is the fascinaing view of the lake it enjoys, where boating is a possibility should the weather & water levels permit. 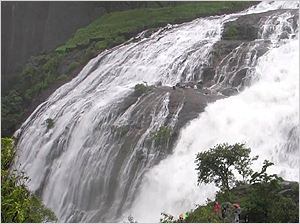 Bhandardara is one of those places which is easy to reach, easy to see & easy on the pocket. It can not be recommended for those tourists who are accustomed to five-star luxuries. It’s a place where the mud squelches beneath your hair. It’s a place where the spray from the waterfall hits your spectacles so that you wish you could install wipers on them too. Bhandardara Dam – (Arthur Lake) one of the highest dam 82 m/m oldest in Asia built in 1926 750 meter above M.S.L. Catchment area 121 59 km. Rain fall 3000 mm., Submerged area 15.36 59 km. And Storage 11 T.M.C. Umbrella Fall – bellow the dam wall picturesque spot. Ghatghar – Picturesque spot, 20 kms. Away from Bhandardara. Pemgiri – 55 kms. Away from Bhandardara towards Akole. There is a fig spread over Acre. One and half. By Train Kasara to C.S.T. 4.10, 6.40, 7.07, 8.18, 11.42, 12.30, 13.20, 15.35, 18.24, 20.28, 21.05, 22.35. All Regional offices of M.T.D.C.